New ProCart wheel rake features individual floating rake wheels for uniform, clean windrows. New Holland is using independent spring suspension on each rake wheel of the new ProCart carted wheel rake for quicker, cleaner and higher-capacity hay raking. Each rake wheel uses a compression spring and linkage pressure system to keep it engaged in the forage at a number of raking angles. Specially curved rake wheel arms provide more space for hay to travel along the rake wheels without bunching to form a smooth line of hay in the windrow. The ProCart folding design does not depend upon a tractor's hydraulic-floating valve. Operators can rake on either side, turn over damp windrows, or select "V" raking with the turn of the hydraulic lock valves. New Holland's new ProCart carted wheel rake is designed for quick, big-raking capacity for easier pickup of windrows. Three new models of the ProCart are available including the eight-wheel 819 that works up to 18 feet, the 10-wheel 1022 model that works up to 21 feet, and the 12-wheel 1225 that works up to 24.5 feet. On the 1022 and 1225 rakes, the operator can raise the front rake wheel when working in heavy crops, like first cuttings, or lower the front rake wheel into position for lighter late-season cuttings. This added flexibility produces the ideal windrow size for the baler, regardless of the time of season or crop conditions. Optional hydraulic raking angle control allows the operator to quickly adjust the working width and windrow width on-the-go from the tractor seat. 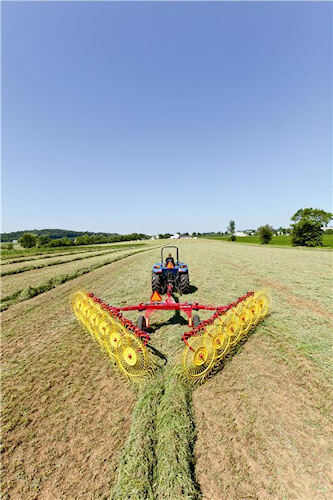 A large, optional 50-inch diameter center kicker wheel moves and turns the hay at the center of the swath that typically remains unraked for faster, more consistent crop drying and easier pickup by the baler. The center kicker wheel is easily locked up for transport or when not required in the field. For more information, click on www.newholland.com/na.